44 www.coalage.com May 2018 product news Cat Celebrates 5,000 th 793 Mining Truck Caterpillar recently completed assem- bly of the 5,000th 793 Mining Truck. The company's data show that the milestone production figure far exceeds the man- ufacture of any other brand of 250-ton- size class truck. In production since 1991, truck number 5,000 represents the fifth generation of the 793. "The 793 Mining Truck is the core of Cat surface mining vehicles," Jean Savage, Caterpillar vice president with responsi- bility for the Surface Mining & Technology Division, said during a ceremony at the Decatur, Illinois, USA manufacturing fa- cility. "The 793 has been an integral part of making Caterpillar the leading supplier of surface mining equipment. I thank the assembly team as well as those who devel- oped the truck and those who support the trucks working in mines around the world." "The success of the 793 supports our belief that it is the most productive and cost-effective mining truck in a wide range of applications," said Sudhanshu Singh, global product manager, large mining trucks. "The 793's success is a direct re- sult of collaboration with customers, Cat dealers and cross-functional teams within the Caterpillar organization — who have worked to optimize the performance of Cat trucks in a wide range of applications. Our very first 793 truck, placed in service 27 years ago, is still in service delivering best-in-class cost per ton." The 5000th 793 truck will be delivered to a mining customer in Australia. The largest populations of 793s are operating in Australia, North America and South Amer- ica where the trucks work to mine iron ore, copper, coal, gold and other minerals. The 793 has built a strong reputation for durability. One of the longest-running 793s was built in 1992 and has accumu- lated 173,000 operating hours — nearly 20 years equivalent — as it works in a mine in the United States. www.cat.com Biomarine Integrates With IWT Biomarine announced that its 4-hour closed-circuit, self-contained breathing ap- paratus, the BioPak 240 Revolution, is now fully approved and capable of complete in- tegration with Innovative Wireless Technol- ogies (IWT) SENTINEL Mine Rescue Com- munications System. Biomarine's recently released AVIWT interface allows mine res- cue team members the ability to fully com- municate intra-team as well as with fresh air command centers via IWT's wireless sys- tem, all contained inside the BioPak face- mask. The microphone installed inside the facemask offers increased safety and the ability to communicate wirelessly through- out IWT's communications network, en- hancing team safety as well as potentially eliminating miscommunications. "The improved communications be- tween mine rescue team members and the fresh air base offered by this system reduc- es chances of errors and improves team safety," said Ted Beck, North American sales and training manager at Biomarine. Use of the AVIWT systems eliminates the need to speak through non-standard voicemitters currently used on many full facemasks. The microphone is installed close to the user's mouth with no barriers between them. This significantly improves communication clarity and provides the best possible sound quality. 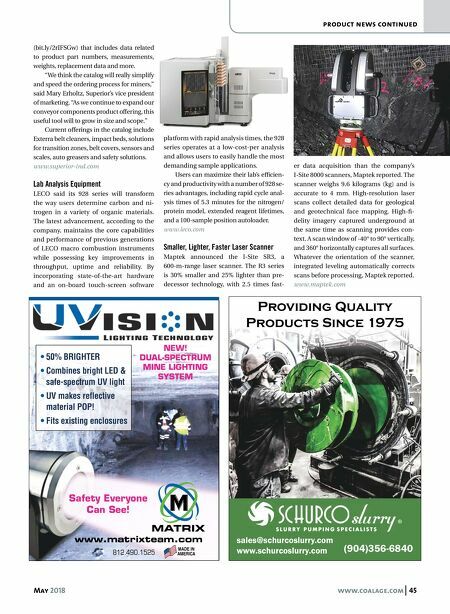 The AVIWT system is National Insti- tute of Occupational Safety and Health and Mine Safety and Health Administration-ap- proved and is the first of its type to gain this type of approval, the company said. 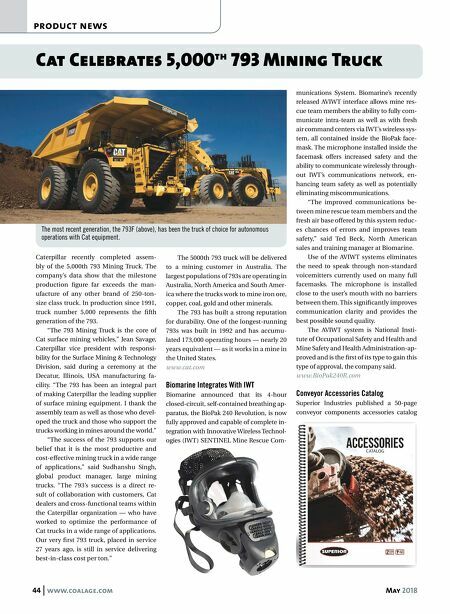 www.BioPak240R.com Conveyor Accessories Catalog Superior Industries published a 50-page conveyor components accessories catalog The most recent generation, the 793F (above), has been the truck of choice for autonomous operations with Cat equipment.